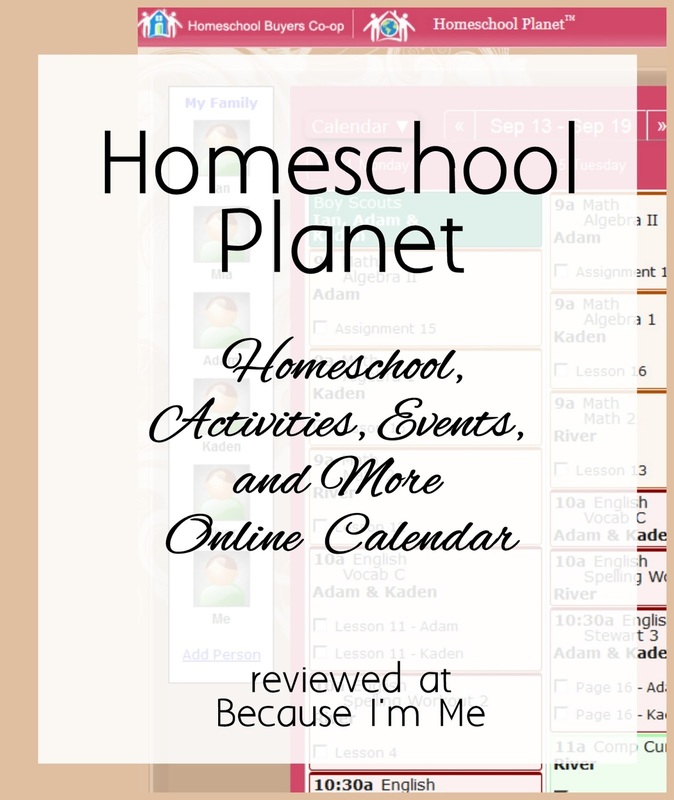 I was recently introduced to Homeschool Planet, an online interactive home and home school scheduling program produced by Homeschool Buyers Co-Op and asked to give it a try. 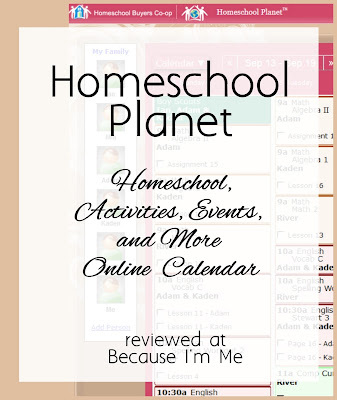 Homeschool Planet is an online scheduling and organizing program, great for schoolwork, household tasks, blogging and/or other home business work, kids activities, chores, etc. ... basically, everything on your plate and those of your family members. To begin, I watched the video tutorials. There are thirteen short videos and they are amazingly helpful and provide lots of tricks and tips to the program that'd take quite a bit of trial and error to find otherwise. 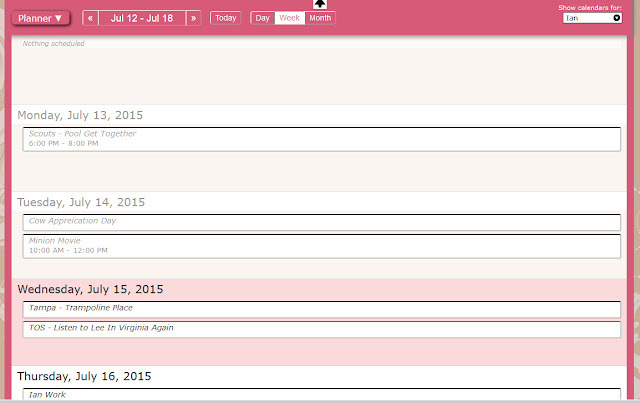 There are also "how to" and "FAQ" sections to the planner answering a lot of oft asked questions. I was very impressed and pleased to see how much effort was put into making this program as easy to navigate as possible. After watching the videos I set up my people. Each family member is represented and by doing this I'm able to assign tasks to just certain people, ie - Adam and Kaden may be attending an event without the rest of us, I can specify that, or River may have an assignment to do for school that's unique to him, with this program I can easily clarify that. We travel a lot in the summer and the kids spend part of the summer with their father so we really don't do a lot of schooling during summer break. However, we do do plenty of stuff. 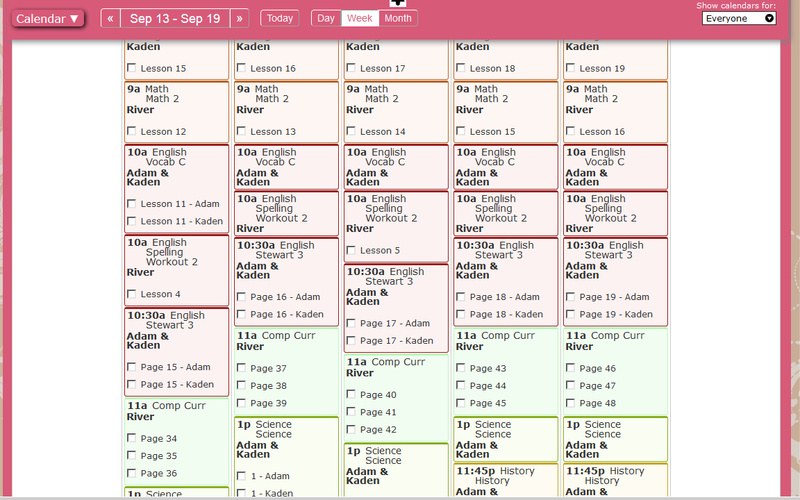 I wanted to be able to enter Adam, Kaden, and River's school schedules in now with correct dates and assignments so I opted to use our "real life" summer schedules (and chores) for the purposes of this review and enter the schoolwork accurately and do a mock run-through of us using the program for schoolwork. Entering the regular activities is a piece of cake. I named the activity, assigned a date and time, if it wasn't all day thing, to it, specified who was doing the activity, and hit save. That simple. 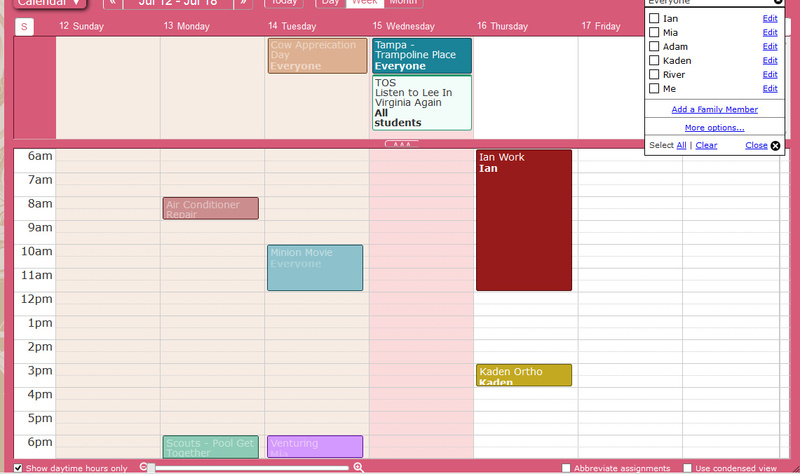 I could then look at everyone's activities using the calendar or planner views. Suppose Ian is asked to do some volunteer work on Thursday afternoon. 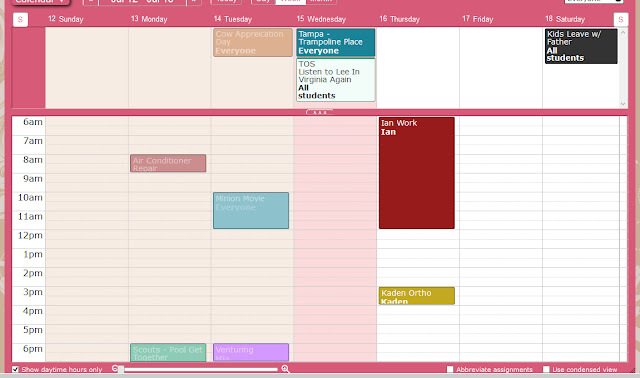 Well, Kaden's orthodontist appointment isn't relevant and neither is anything else that Ian isn't doing, I can go in and alter the settings so I'm only seeing what Ian has on the calendar, making it much easier to know if he can do that volunteer work or not. 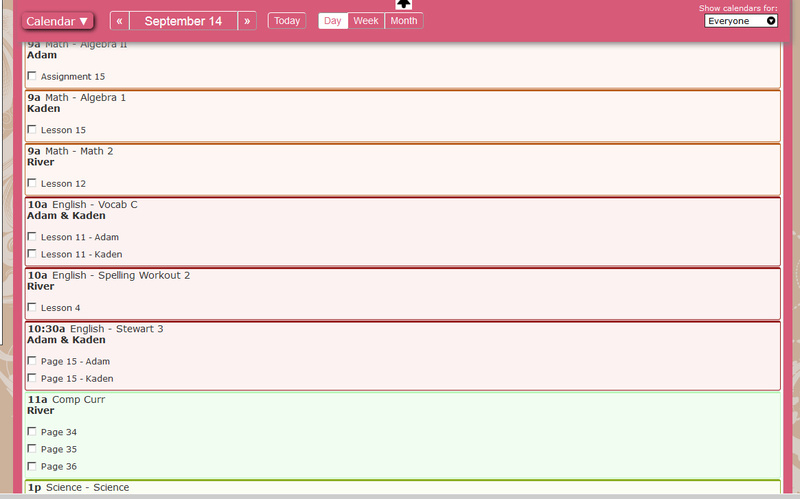 I could also print out his calendar, or planner view, so he knows what his week looks like without the clutter of everyone else's schedule.. Entering the schoolwork was also very simple. I chose a subject, chose a child (or children) to assign the work to, and a time of day. 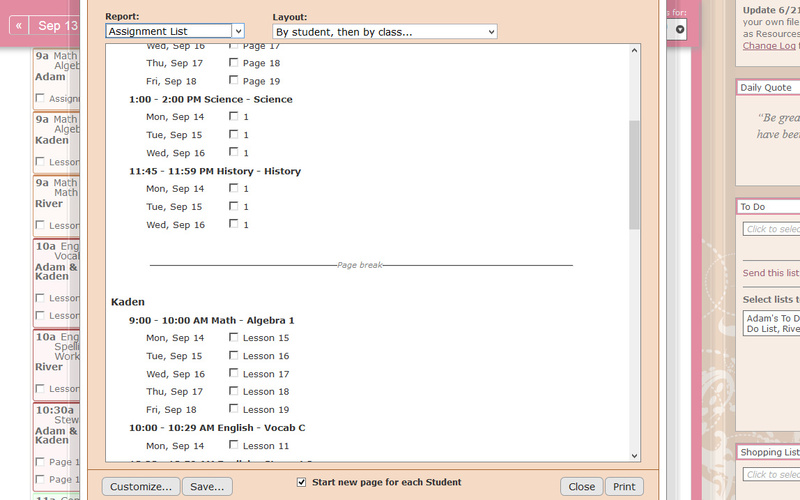 Typically, I do our school schedule manually on a sheet of paper. 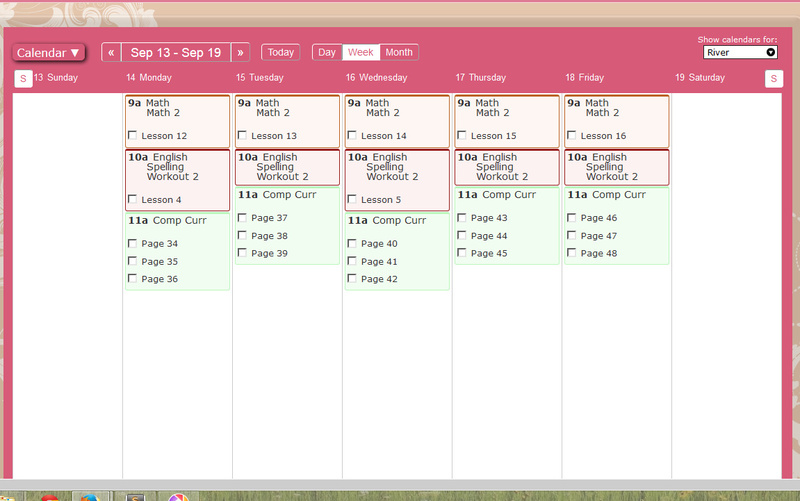 With some subjects we do 1 assignment per day, every day, with some we do lesson 1 on Monday, 2 on Tuesday, 3 on Wednesday, etc., some things we do daily, some every other day, some once a week, and some Monday through Thursday. 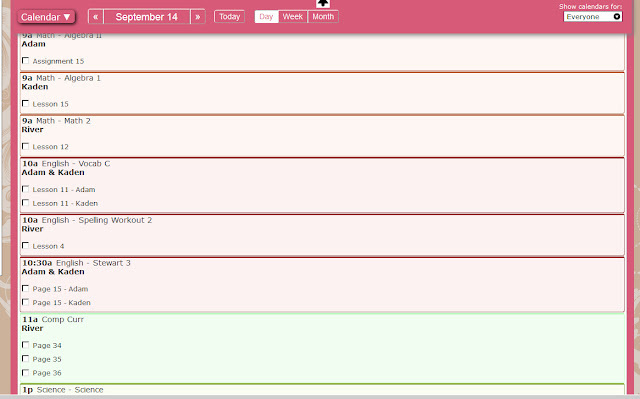 River does workbooks that need to be done by the end of the year and he does 2-3 pages per day. On notebook paper with a pen this is super simple and takes me about 10 minutes each Monday morning. Quite frankly, entering all that into this program sounded like a real pain the neck. Well, it wasn't. The program is designed to handle all those idiosyncrasies and more. I simply entered my parameters, the entered the days of the week we did the assignment, and the assignment on the calendar was generated the way I wanted it to be. There's even an option to complete a certain number of assignments or pages by the end of the year that'll automatically calculate how many pages to do per day. 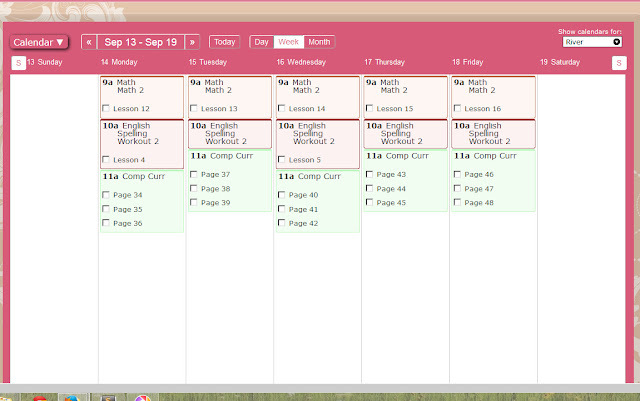 I was done entering the entire years worth of work in about 30 minutes. 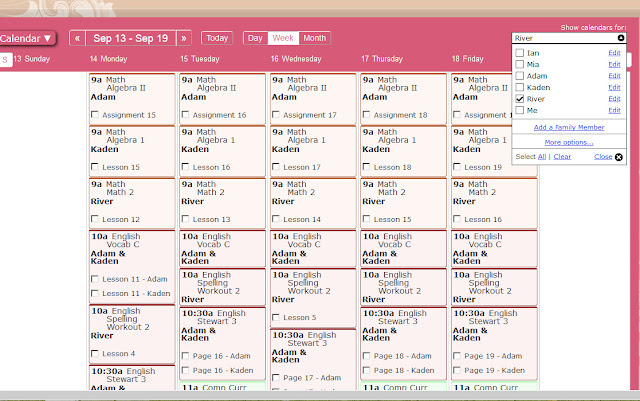 Of course, I don't always need to know what everyone needs to do, so I can again print the schoolwork for just one student by isolating them and generating a printable calendar or planner for them. 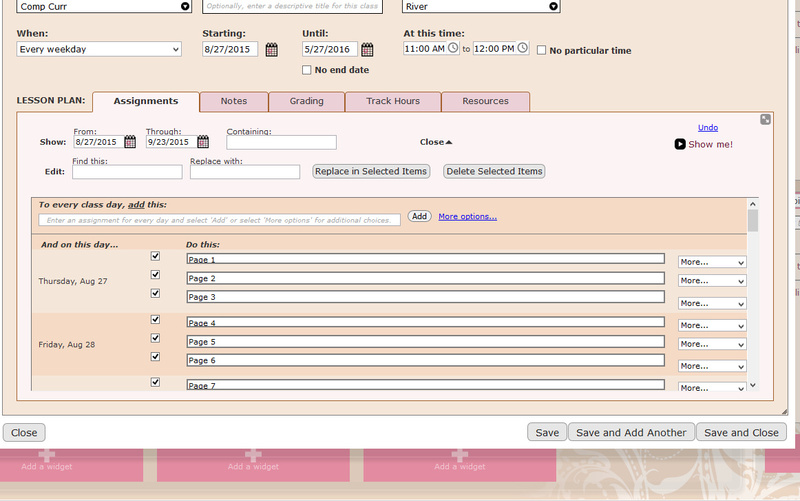 The program will track assignments past due and ask what to do with them. They're not just going to disappear (much to the kids' dismay) and can be marked as completed or carried forward as assignments still needing to be completed. It is very easy to print reports of schoolwork to do or completed, calendar views and planner views, as well as other reports. The calendar you create can be shared with Google calendar or Apple iCal. Also, log in information can be created for each child so they can view their own schedules on their mobile devices. 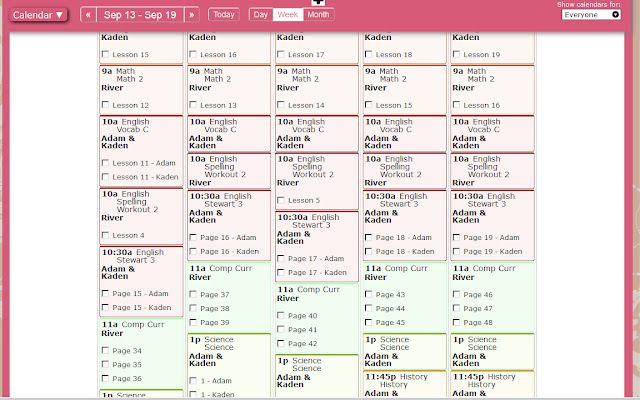 I think this is going to be a great way for me to share the kids assignments and schedules with their father when he comes to town. 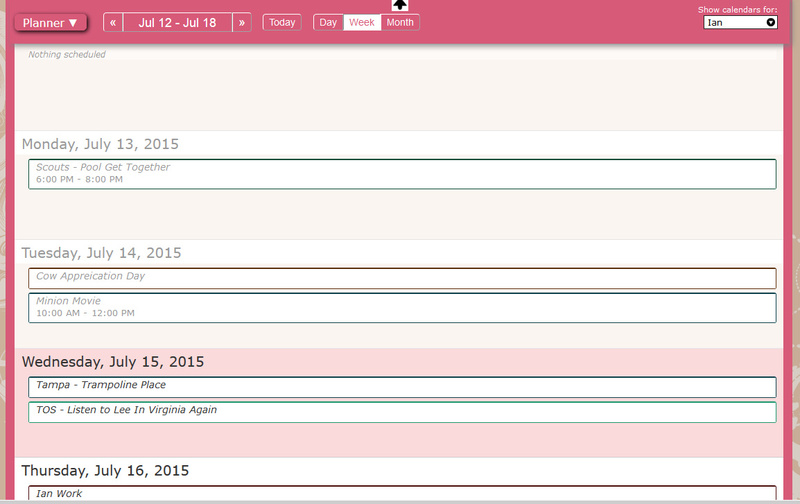 I have really only touched the surface of the assets and benefits of this easy, multi-faceted planner. Right now, a 30 day free trial of Homeschool Planet is available at Homeschool Buyers Co-op and I highly recommend giving it a try! 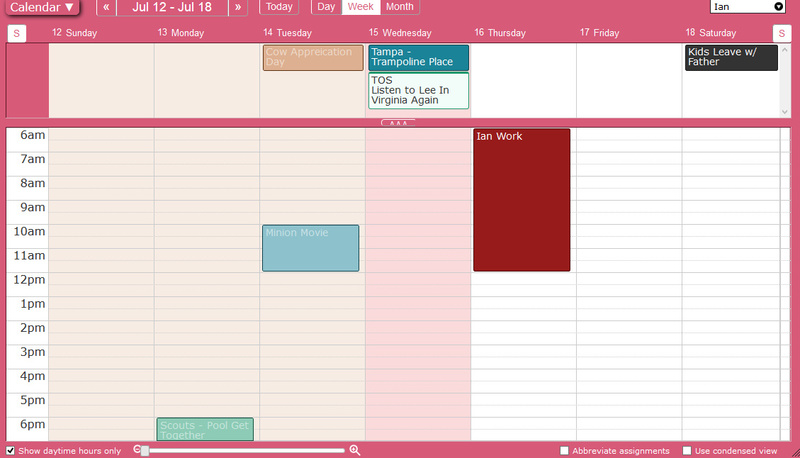 Take a look at some more of the TOS Review crews reviews of this planner to see how they used it.